Bromadiolone, the active ingredient in Just One Bite® II is a second-generation anti-coagulant rodenticide. May consume a lethal dose of bait in just one feeding. Kills roof rats, Norway rats, and house mice. Delays death 4 to 5 days so there’s no bait shyness. 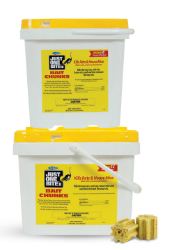 For indoor and outdoor rat and house mouse control Bait chunks fit in burrows, runways and hard-to-reach areas where rats and house mice live and breed Features nibble ridges to promote rat and house mouse chewing The hole through the middle allows for mounting in bait stations.